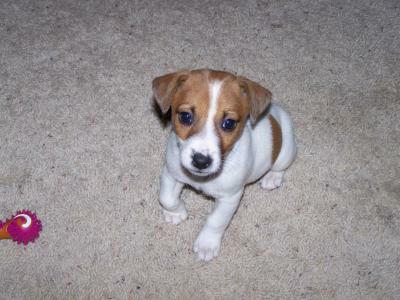 This is my family's new 6 week old Jack Russell Terrier, Rosie. Isn't she gorgeous? Already potty trained and so smart! The whole family is just in love with her! Rosie is incredibly cute and reminds me a bit of our Jack Russell at the same age. What a cute little Rosie she is! I have no doubt the whole family is in love with her. Great looking dog Julie.